Travis Hammond is an Army Ranger that suffered both physical and emotional wounds. Uncertain what his future holds, he accepts a friend's offer for a job in a little town called Covenant Falls. The job, though temporary, is for helping veterans using equine therapy. Jennifer Talbot is a wartime correspondent and like Travis suffered both physically and emotionally. Jenny takes an interest in equine therapy and travels to Covenant Falls to learn more about it. The two notice a spark between each other but have different goals. Will Jenny and Travis be able to find a middle ground for both of them? I found the book to be a fun an interesting read. The characters were refreshing and nor were they portrayed as perfect people but as people who are trying to make the most of their circumstances. I like that the story focuses on a therapy that is both beneficial for the animals and humans and they can work together in harmony to help and rely on each other. My only qualm is that the story was a bit to slow at some parts, but that could be because I am just impatient to see if Jenny and Travis get their happy ever after. It was a good read and I would definitely read other books by the author. Patricia Potter is the USA Today Bestselling Author of more than fifty books. She has received numerous writing awards, including RT Storyteller of the Year, its Career Achievement Award for Western Historical Romance and its Best Hero of the Year Award. She is a seven-time RITA finalist and three-time Maggie Award winner. 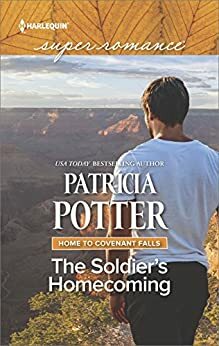 She has served as president of Romance Writers of America.The Soldier's Homecoming is her fifteenth book for Harlequin. Thanks 4 sharing this and congrats on the tour.